In 2005, Nygaard teamed with beach Olympian Dax Holdren, winning in Santa Barbara which gave him a domestic victory for the fourth straight season. 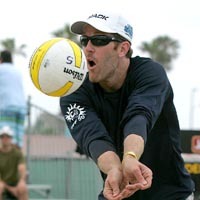 In 2006 he teamed with indoor Olympian John Hyden, Nygaard's partner in his first ever beach event in 2001, and one of four different Olympians Nygaard has played with on the beach. He was awarded 2003 AVP Most Valuable Player and AVP Team of the Year with partner Dain Blanton after he topped the AVP victory list with three titles in eight events. Earned his first victory in just his 10th event when he won the 2002 Hermosa Beach Open with Albert Hanneman, becoming one of just three players to win a title since 1986 in his first 10 events. A two-time indoor Olympian for the <?xml:namespace prefix = st1 ns = "urn:schemas-microsoft-com:office:smarttags" />United States, Nygaard competed on the beach for the first-time in 2001 appearing in seven AVP events. Was a middle blocker on the 2000 USA Olympic team. Competed on the United States National Team for eight seasons (1993-2000). Played in the Athens Games in 2004 on the beach with Blanton, finishing 19th. Nygaard ended the 2006 season ranked seventh in blocks (1.68 per game) and fifth in kills (7.43 per game). In 2007 he was eighth in kills (6.91 per game), ninth in hitting percentage (.411) and 10th in blocks (1.44 per game). A Wisconsin native, he has one older brother (Brad), who is his role model. Nygaard majored in English at UCLA. Following the Olympics in Athens in 2004, he married Renee Schindler, and they have a daughter (Sophia), born in early 2007.